Pepe Julian Onziema is a world-renowned LGBT activist from Uganda who currently serves as Deputy Director of the NGO Sexual Minorities Uganda. In addition to being featured on Last Week Tonight with John Oliver, Onziema has been named a Global Citizen by the Clinton Global Initiative and was Stonewall's "Hero of the Year" in 2014. A transgender man, Onziema has been arrested multiple times while advocating for LGBT rights in Uganda, a country where homosexuality was once punishable by death. 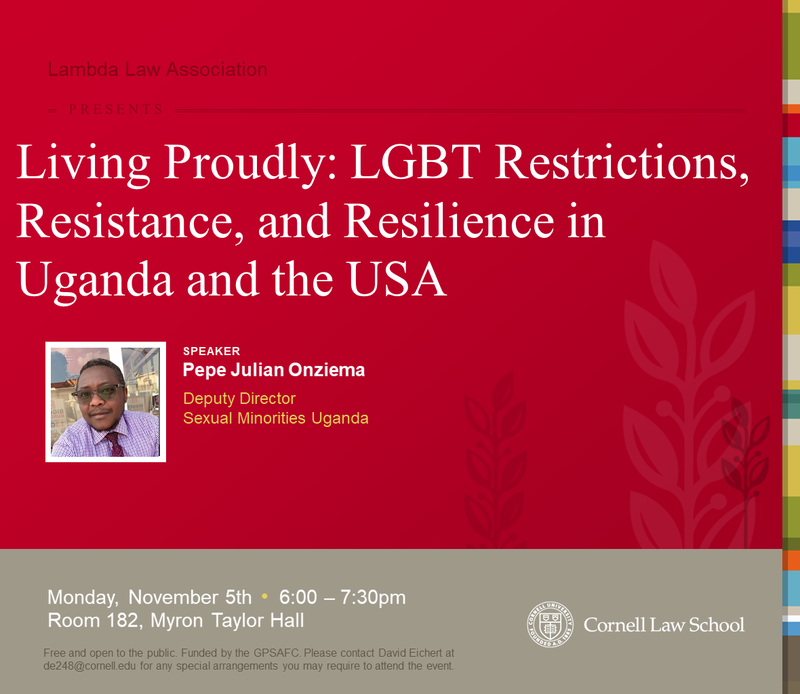 Onziema will describe his life and work, as well as the lawsuit his organization filed in the United States against Americans who are facilitating anti-gay sentiment in Africa. Q&A will follow. Open to the graduate community. Free and open to the public. Funded by the GPSAFC. Please contact David Eichert at de248@cornell.edu for any special arrangements you may require to attend the event.